The Diva paddle switch automatically returns to your favorite pre-selected light level. The soft locator light becomes illuminated when the dimmer is in the “off” position. Locator light on select models. The Diva paddle switch automatically returns to your favorite pre-selected light level. The C·L models with HED Technology improve dimming performance of dimmable CFLs and LEDs compared to standard dimmers. 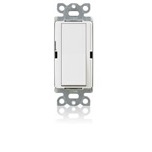 Dimmer for 0-10 V Drivers and Fluorescent Ballasts. Large paddle switch with a captive linear slide dimmer for a standard designer wallplate opening. This model features coordinating Claro and Satin Colors wallplates, including stainless steel. 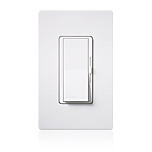 This model features coordinating Claro and Satin Colors wallplates, including stainless steel. The soft locator light becomes illuminated when the dimmer is in the “off” position. The Diva paddle switch automatically returns to your favorite pre-selected light level. The soft locator light becomes illuminated when the dimmer is in the “off” position. The eco-dim model guarantees at least 15% energy savings compared to a standard switch.